Welcome to Feelness, the first EMS Power lounge in HK. Our personalized EMS fitness training sessions with Personal Trainers give you the best results in the shortest time in the heart of Hong Kong. We are in Central, directly opposite the 4 Seasons Hotel and in Causeway Bay between Times Square and Hysan. Each EMS training session lasts only 20 mins and is as effective as to 3 X 90 minute sessions of normal exercise with EMS technology giving you a full body workout. Enjoy your workout in a luxurious and private facility. Everything is provided for you, so you literally don’t have to prepare or bring anything. 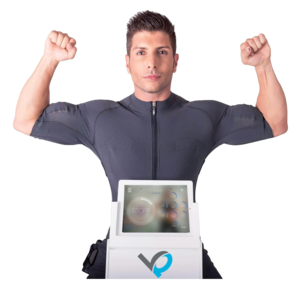 With EMS technology our personal trainers will take you through a series of simple movements that will help you to lose weight, tone muscles and increase strength and flexibility. EMS technology has been used since the 1950s in hospitals and physiotherapy with no side effects or for Professional athletes to build strength, speed and endurance but EMS Power Lounges are now increasing in popularity in 26 countries around the World for everyone to experience. To find out how effective they are, pls book a consultation with a trial session in our Feelness Power Lounge in Hong Kong. Book your EMS experience today. Call us in Central 24562281 or Causeway Bay 24561300.